Also serving communities of Norwich. There are 3 Assisted Living Facilities in the Oxford area, with 2 in Oxford and 1 nearby. Caring.com has helped thousands of families find high-quality senior care. To speak with one of our Family Advisors about assisted living options and costs in Oxford, call (855) 863-8283. Oxford, New York is a little town located alongside the Chenango River and is full of rich history and diversity. In the 1800s, Oxford was home to two of the most productive quarries in the United States. This city is a very small suburb with only a population of 3,901. Because Oxford is so small, options for assisted living are also extremely limited. There are only three assisted living facilities - or adult care facilities (ACFs), as they are known in the state of New York - in the Oxford area, with two in Oxford and one nearby. ACFs are defined by the state as establishments giving long-term, non-medical residential services to adults who can't take care of themselves. Three types of ACFs exist within the state, including adult homes and enriched housing programs, and are regulated by the New York State Department of Health. Though New York state is 22 percent more expensive than the rest of the nation, Oxford itself is 16 percent cheaper than the country's average cost of living and 38 percent cheaper than the rest of New York. Oxford's economic cost of living could be a draw for seniors searching for affordable care. The Oxford area has no facilities from which to choose in the event of a medical emergency or illness, with the nearest major hospital located in Oneonta. The highest average temperature for Oxford is 70 degrees. Because this town is typically cold and rainy, with the rainiest month averaging five and a half inches of rain, seniors should consider the amount of time they spend out-of-doors when contemplating assisted living in Oxford. Compared to the national average, the air quality in Oxford is exceptional. With a score of 89 as opposed to the national average of 58, the air in Oxford has been deemed almost entirely free of harmful pollutants. Seniors who have a need for high-quality air should consider Oxford. Crime rates in Oxford are approximately 14 percent higher than the national average and should be examined by seniors if desiring a safer neighborhood for assisted living. Chenango-First-Transit is one of the methods of public transportation within Oxford. Though vehicles are disability accessible and smoke-free, this public transit system only offers senior discounts with proof of Medicaid cards. Assisted Living costs in Oxford start around $0 per month on average, while the nationwide average cost of assisted living is $4,000 per month, according to the latest figures from Genworth’s Cost of Care Survey. It’s important to note that assisted living rates in Oxford and the surrounding suburbs can vary widely based on factors such as location, the level of care needed, apartment size and the types of amenities offered at each community. 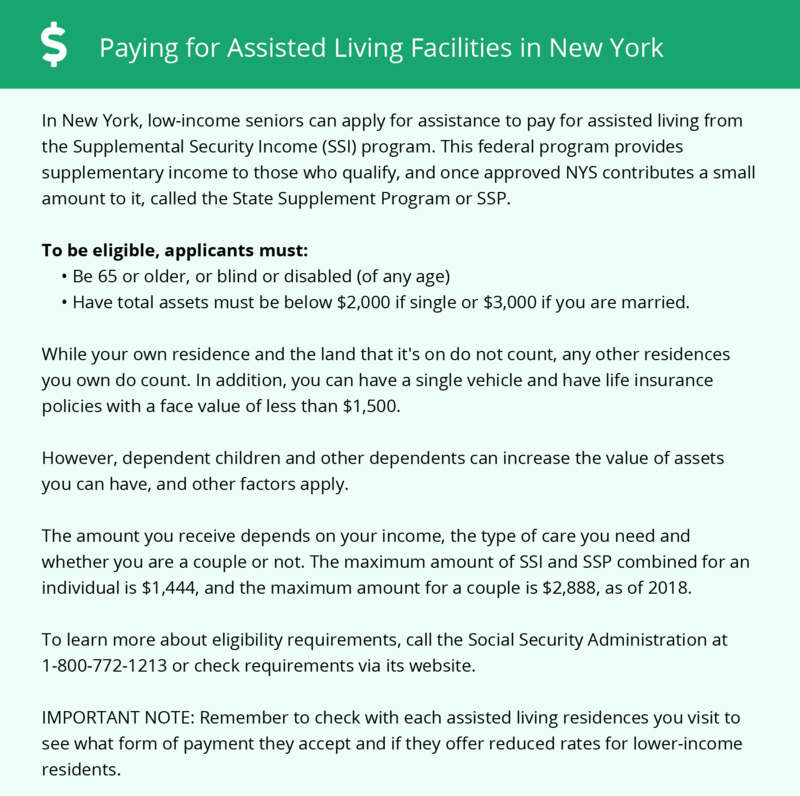 Though New York offers financial assistance for seniors via the Medicaid program's Assisted Living Program (ALP) waiver, this opportunity is restricted to 4,200 persons. Oxford and the surrounding area are home to numerous government agencies and non-profit organizations offering help for seniors searching for or currently residing in an assisted living community. These organizations can also provide assistance in a number of other eldercare services such as geriatric care management, elder law advice, estate planning, finding home care and health and wellness programs. To see a list of free assisted living resources in Oxford, please visit our Assisted Living in New York page. Oxford-area assisted living communities must adhere to the comprehensive set of state laws and regulations that all assisted living communities in New York are required to follow. Visit our Assisted Living in New York page for more information about these laws.